Occurrence and features of uveitis in patients with rheumatic diseases: current peculiarities of clinical examination and patient management. Fluorescent angiography and optical coherence tomography with angiography of the ocular fundus in patients with "the wet" form of an age-related macular degeneration. 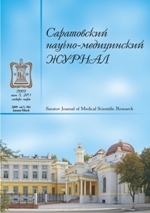 The efficiency of modern methodics of laser refractive surgery according to the clinical experience of the Ophthalmology Clinic of the Saratov State Medical University. Кости швов и родничков свода черепа человека. Revisiting of etiology, clinical picture and diagnosis of the Kleine-Levin syndrome. The turmeric protective properties at ethanol-induced behavioral disorders. Обоснование оптимизации первичной медико-санитарной помощи трудоспособным пациентам с диагнозом «артериальная гипертензия». Радиационные риски: торжество идеала или уход от действительности? Базовые основания профессионализации фтизиатрии в оценках экспертов. Synchronization of low-frequency rhythms in electroencephalogram by respiration with linear dependent time frequency. Clinical pharmacology for doctors of different specialties: the results of annual Interregional conference "From theory to practice: opportunities and difficulties of modern pharmacotherapy"